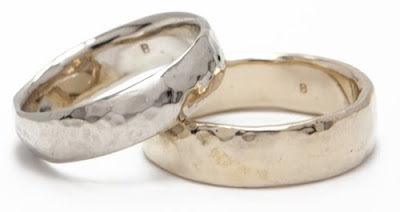 Bittersweets Wedding Bands for Men! Our current collections of wedding bands are the Bittersweets response to calls for simple, modern-classic bands. Didn't your mother always tell you what's Bittersweets for the goose is Bittersweets for the gander? We so loved watching ladies slip their Letter Ring Royales on their left ring finger for the very first time, that we decided to make a wider version of this ultra slim band for guitar-playing gentlemen far and wide. The resulting Thin Line collection is available in 4 widths, 3 colors of gold, and 4 finishes, so you can choose your ring like you chose your love. A wide range of personalization is available - letters, numbers and symbols. The Cowboy collection is a bold choice for the bold couple who desires a substantial and weighty band. 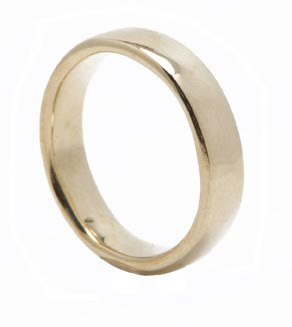 Each ring is carved from wax and lost in the casting process, resulting in a one-of-a-kind wedding band. Matte and shiny finishes accentuate beautifully faceted and hammered texture. Finally, we have the Gatsby Collection. All of your bands in these two collections are carved out of wax, according to your size and specifications. The Gatsby offers your choice of matte or shiny finish on an elegantly carved ring, boasting a sleek line befitting Mr. Fitzgerald's gorgeously fallen heroes & heroines. If you're reading this blog, there's a good chance that you've already noticed that the bittersweets website has been relaunched with a new, easier to use design, new images and new products! We also added a new category to the online shop - Wedding! A few months ago we released the Twig wedding ring collection and we received such an amazing response to it that we wanted branch out further in this new direction. We've added men's wedding bands, special bridesmaid present discounts, a simple yet luxurious necklace for the big day and more to come soon, including pieces for the mother-of-the-bride and new ring designs. Since the site is so new, you may experience some kinks, though hopefully not. 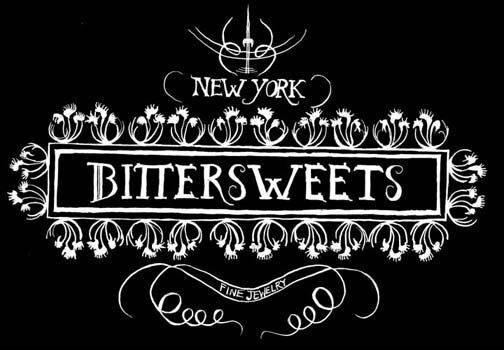 If you have any issues with it, please send an email to info@bittersweetsny.com so we can resolve the problem. We're very proud of the site and hope you like it.